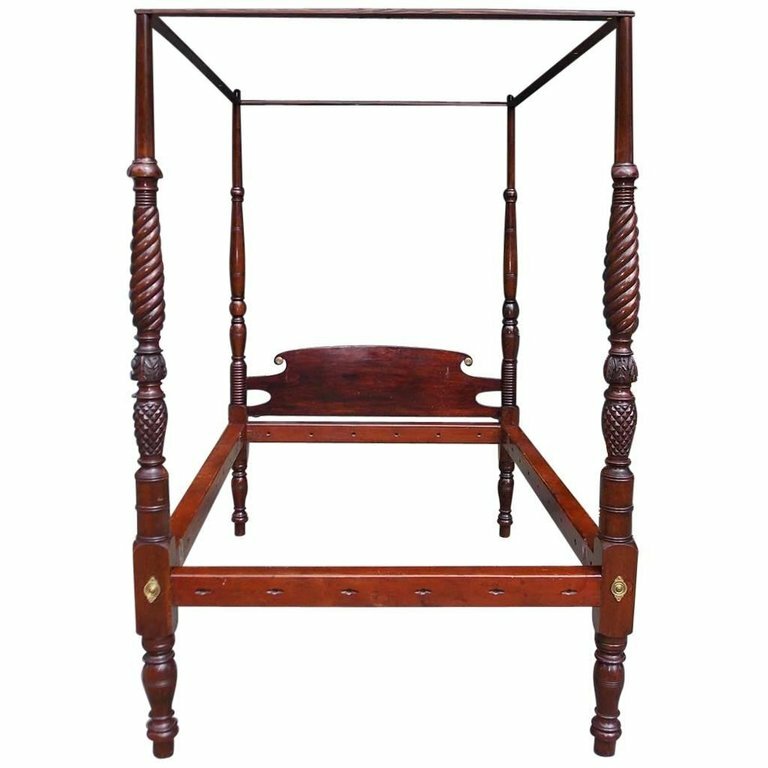 American classical mahogany four poster tester bed with scrolled ormolu headboard, turned bulbous ringed head post, flanking spiral carved foot post with deep carved pineapple and acanthus leafage, pine side rails, and resting on turned bulbous ringed feet, Early 19th century. Attributed to Samuel McIntire, Salem, Mass. Samuel McIntire (January 16, 1757–February 6, 1811) was an American architect and craftsman, best known for the Chestnut Street District, a classic example of Federal style architecture. Born in Salem, Massachusetts to house wright Joseph McIntire and Sarah (Ruck), he was a woodcarver by trade who grew into the practice of architecture. He married Elizabeth Field on October 10, 1778, and had one son. He built a simple home and a wood workshop on Summer Street in 1786. Interior measurements: 72.5 long / 48 wide. H 83 in. x W 54 in. x D 78.75 in.